With mankind facing an alien cataclysm, your elite Delta force and North Korean forces combine, united by common humanity in a battle to save Earth. Graphically stunning, tactically challenging and always intensely immersive, Crysis sets player choice at the heart of its gameplay, with customizable tactical weaponry and adaptable armor allowing instant response to changing conditions. Judging from the downloadable demo, Crysis doesn't feel all that different from its predecessor, Far Cry. Both are set on an island. Both involve a latent alien menace. Both bid you move more or less linearly through shaggy jungle areas, where the fact that you're progressing in a single direction is camouflaged by your ability to approach obstacles in your path any way you like. Think the "every time you play a situation yields radically different behaviors and results" approach in games like Rainbow Six Vegas or Gears of War except on more of a geographic scale. Oh yeah, you probably want to hear about how it performs, right? 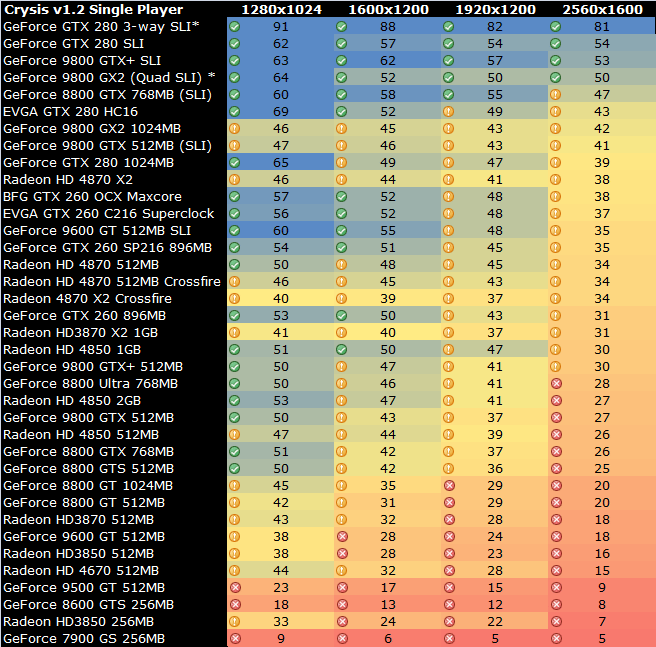 Benchmarks are done with the full game, patched to v1.1.